A computer virus is named as such because it imitates the behavior of a real world virus. It attaches itself to a host executable and gets launched along with it; at that point it searches for other executables that it can infect. Worms, on the other hand, do not require or utilize a host in order to propagate. It creates copies of itself which can then spread on removable drives, the network, or even on the internet. Although virus has become the blanket term covering all unauthorized programs that execute and replicate itself, malware is the right term to use to cover virus, Trojans, worms, and all other malicious software. The primary advantage of worms is that they can spread far quicker compared to virus. If you have a removable drive like a flash drive that contains text files, a virus cannot infect any file there. But a worm can copy itself unto the drive and wait till it gets plugged into another computer then copy itself to that computer. As standalone programs, worms do not require the users to run programs before it can execute, it exploits weaknesses in the system in order to replicate; i.e. the autoplay feature of windows. Because worms are not attached to other files, they can easily be singled out and deleted by knowledgeable users. In order to avoid detection, they often masquerade as a dll or a system file by copying their filename with a little variance. For both worms and virus, their replications and propagation are not the major concern for most people as that only creates a very minor inconvenience like eating up disk space and eating up processor time. The real problem is the payload or the part of the program for which it is intended for. Some simply create harmless messages on certain days or modify a text field so that it says another thing. Others create some greater problems like disallowing access to certain commands and properties which also makes it harder to remove them. And the most destructive malware destroys data that can often render a computer unusable until it gets reformatted. 1. Virus needs hosts while worms do not. 2. Worms can spread quicker than virus because it does not need human action to replicate. 3. 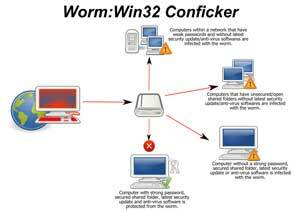 Worms often disguise themselves as DLLs or system files to avoid detection. 4. For both, the payload carries code that does the real damage. Ben Joan. "Difference Between Worm and Virus." DifferenceBetween.net. December 25, 2010 < http://www.differencebetween.net/technology/difference-between-worm-and-virus/ >.